A startling whoosh of the magnificent hawk as it takes flight, its powerful wings flapping strong and steady, ascending, until a gentle gust pulls it up, and with wingspan fully extended it gracefully glides across the sky, scanning the landscape. Suddenly, I’m keenly aware of dozens of birds around me: a cardinal couple engaged in a mating dance on the branches of the bare crape myrtle; a blue jay silently watching from its perch on a neighboring tree; mourning doves poking around in the grass, picking up scraps of seeds that others have cast out of the feeder; and tiny sparrows flitting in and out of the bush at the edge of the flower bed. How often I take for granted these amazing creatures who every day put on a most awe-inspiring show of natural performance. Taking a few moments to ground myself, I take a front row seat to the spendor that lie before me. Watching. Still. Surprisingly peaceful. Fulfilled. And wondering. What would it be like to be a bird? I know I have often wondered that in times past but haven’t thought about it much lately. What would it be like to be so free? So unencumbered, shifting direction with effortless maneuverability and graceful movement. I wonder if my world view would change if I had a birds-eye view. No mortgage to fret about, no relationships weighing heavy on my heart, no baggage from the past, no worry about tomorrow, no politics to scream about, no fear of our world’s future. Oh, how I could love being a bird! Would be fun to join them for sure! Oh how fun! 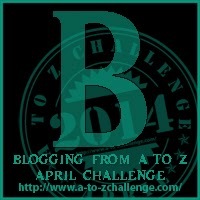 A visit to last year’s A-Z! I’ve been so busy with this years that I forgot what I did for all the letters last year. Last year I didn’t do a theme. This year I did. Not sure what I’m going to do next year… It was fun though, wasn’t it? Thanks for stopping by!